← Downton Abbey Is Back. Jeans and boots complete the picture. I’m not sure how muddy the yard is or in what condition the shed is where the end tables currently reside. 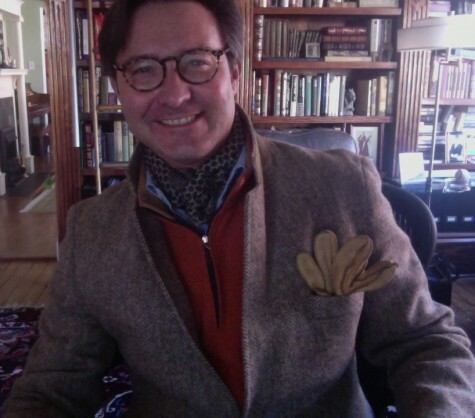 But, as it is around 55°F, a tweed jacket and cash-cotton sleeveless sweater by Peter Milar should suffice. Tweed is the original outdoors fabric after all. This entry was posted in Elegantology and tagged cash-cotton vest, casual clothing, sleeveless sweaters, Tweed. Bookmark the permalink. Yes Chris, tweed is wonderful this time of year. One of my sartorial objectives is to add two more tweed sport coats to my wardrobe. I do need to watch my budget though. Bit by bit it will all come together in due time. You sure are dressed well for beating the elements. Tweed will keep you warm. You look as spiff as an English land lord! And that jacket has real pockets! Utility and style. Gosh, but it’s good to see you again – and you never, ever disappoint – still wonderfully put together, even on the worst days! I’m afraid that I’ve let myself slide too much, though, in this fickle Dallas weather, but you’ll be proud to know my scarves always match my gloves, hee-hee. Now,you’ve got me searching for my boot polishes right away! I’ve worn my dear tweed jacket threadbare, but it’s so warm and fits so well, I’ll never give it up!